We welcome all visiting students to get involved in the programs and activities organized through the Student Hub. This is your special place and we want you to make the most of it! Located in the heart of Cairns city, the Student Hub provides a welcoming space for visiting students to use as a space to connect with fellow students, colleagues and the wider student community. Our Student Hub Coordinator manages the Hub and is assisted by a team of enthusiastic volunteers. Volunteers help out in many ways to assist other students to enjoy their time in Cairns. Visit the Volunteer page to find out how to volunteer at the Student Hub. Student Ambassadors are enthusiastic supporters of the advantages of living and studying in Cairns. They engage with fellow students and the wider community to wave the flag for the educational tourism network across Cairns. Student Ambassadors get to experience many Cairns tourist attractions. They assist at major Events held in Cairns. They meet the Mayor of Cairns along with official delegation visitors and are exposed to international and domestic media. Plus, they get to make new friends and help other international students. The Student Hub is actively seeking Student Ambassadors to represent the international student community and to promote Cairns as a study destination. Visit the Student Ambassador page to find out about becoming a Student Ambassador. Study Cairns in collaboration with its partners, members and the Student Hub is developing an exciting Internship Program! 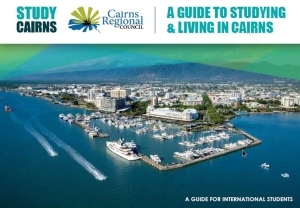 Visit the Internship page to find about Internship opportunities for visiting students in Cairns. Interesting in speaking with us about your options? click the link below.